Here you will find a marvelously witty, informative and sometimes downright libelous account of the happenings in the famous town of Abbeyfeale, Co. Limerick. Ireland! Read all about our eccentric characters and the many sporting achievements, (real or imagined) of our various teams. Experience the natural beauty, the unique atmosphere, the music, the company and the craic. We get numerous visitors to our town every year. Most promise to return. Some never leave. All have an unforgettable time. A FEAST OF DRAMA: The Abbeyside Players take to the Glórach stage with their production of the famed John B Keane play, The Chastitute on Thursday, January 31. Capturing the plight of love hungry farmer John Bosco McLaine and his doomed attempts at romancing, the play is quite humorous but also critical of the repressive mores that tormented the mind of the title character. 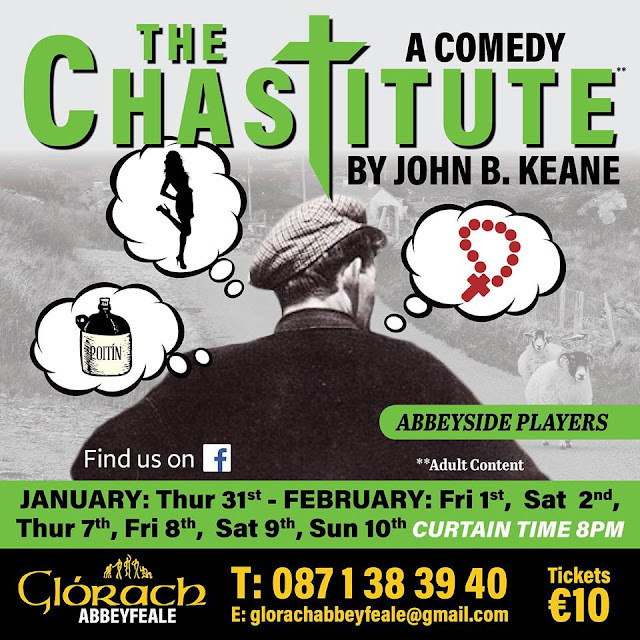 As soon as The Abbeyside Players finish their run the Abbeyfeale Drama Group take the stage with ‘Marriage of Connivance’ from February 12. GLÓRACH: Bingo continues on Monday nights at 8.30 pm. CONRADH NA GAEILGE FESTIVAL: Tionól (Irish language and Music w/e) Chontae Luimnigh present the first, hopefully of many gatherings of Folklore, Music, Poetry and History of Abbeyfeale through the Irish Language in Fr. Casey’s Friday, February 8 and Saturday, February 9 with daily admission just €5 per day. The official opening takes place on Friday from 7pm followed by a lecture from Séamus Ó Coileáin from Athea and ending with a traditional music concert with the Murphy family, Riona Ní Churtáin, Denis Curtin and the Flannery Sisters. Saturday’s programme includes lectures, a bilingual walking tour of Abbeyfeale and a traditional music session. All are welcome. CALL FOR LOCAL VOICES INTO A NATIONAL VOLUNTEERING STRATEGY: The Dept. of Community and Rural Development have promised to bring about a National Volunteering Strategy. To this end Limerick Volunteer Centre are calling a Focus Group meeting in Newcastle West, in The Longcourt House Hotel, Thursday, January 24, at 7pm. We are aiming to discuss just 5 of the more important aspects at a number of tables. Local group contributions will be submitted for the composition of the strategy. This very interesting and interactive format will take no more than about 90 minutes. Anybody who is involved in any organisation as either a volunteer or a manager in West Limerick will be able to have their say in what should comprise an effective National Volunteering Strategy. To book a place go to www.volunteeringstrategy.ie/limerick or call 087 738 7481. WRITING, KNITTING AND CROCHET GROUPS: The writing group is back on Fridays from 11am to 1pm. Knitting and crochet begins Tuesday January 29 from 7 – 9pm in St.Ita’s Hall Main St. New members always welcome. FR. CASEY’S CARDS 18/01/2019: Winners with 12 games; Tom Lenihan, Connie Collins, Eddie O’Connor. Runner-up divided between four teams each with 12 games were; Bridie Collins, Dan Casey, Tommy Nelligan. Liam O’Connor, Jamsie McEnery, Beth Collins. Eamonn Scannell, Sean O’Connor, Bill Blair. Sean Harnett, Dan Dillane, Tom Murphy. Door prize; Mickie O’Connor. Table prize ; Noel Murphy, JD Foley, James Connell.Raffle winners were;Jamsie McEnery, Gobnaith Scannell, Beth Collins, JD Foley, Tom Murphy, Pat Collins. CLASSES IN THE ADULT EDUCATION CENTRE (OLD TECH): The following are a small sample of the classes on offer in Mountmahon:, Computer Classes for beginners started Tuesday, January 22, Abbeyfeale Wellness Monday January 28. Then in February it is hoped to run classes in Container Gardening, Up cycle your wardrobe, Healthy Meals in 10 minutes as well as an Introduction to the Hair and Beauty Industry, Wood Turning Level 3, Care Skills Level 5, Special Needs Assisting. Then in April classes will run in Child Health and Well Being and from Plot to Plate. SHEP – THE SOCIAL AND HEALTH EDUCATION PROJECT: Two new programmes available in West Limerick, ‘Effective Communication for Better Relationships’ in St Ita’s Hall, Abbeyfeale, begins on Monday, January 28, from 10.00am to 12.30pm for 8 weeks (to March 25). ‘An Introduction to Personal Development’ in the Desmond Complex, Newcastle West, begins on Wednesday, January 3, from 10.00am to 12.30pm for 8 weeks (to March 20). Please contact Adrienne at West Limerick Resources on 087-2773294/aoconnell@wlr.ie for further details and to register your interest.